This is an implementation based on the dcamnoise2 GIMP plugin, modified to support 16bit images. This uses the GREYCstoration algorithm included in the CImg library. In this simple tutorial we'll be using the dcamnoise2 approach as it's results are quite good and the GREYCstoration plug-in is really too slow to be comfortable to work with. 2. Adjust the settings in order to get the best results. Radius sets the size of the blur kernel. 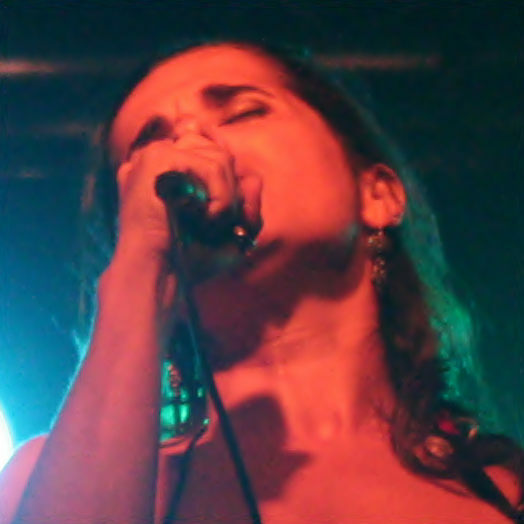 Larger values mean more aggressive noise reduction but also mean a more blurry image. Threshold limits the number of pixels that will be affected by the blur. Sharpness controls the amount of sharpening to compensate the blur. Edge Lookahead is used to limit the blurring. 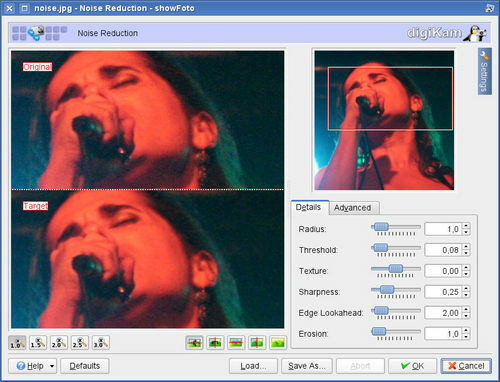 Higher numbers result in sharper images but reduce the amount of nosise reduction. 3. I was satisfied by changing Radius=3.0, Threshold=0.07 and Sharpness=40.00, keeping all others values at default values. 1. New image editor noise reduction plugin..., Gilles Caulier, digiKam-users mailing list.